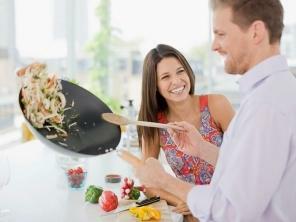 It can be nerve wracking the first time you make a meal for the lady you’re dating. It’s tempting to try and make a dinner that has the restaurant quality. Just one problem: You’re not a chef (unless ordering pizza counts). But don’t worry, there are thousands of recipes which can be easily made and will really impress your girlfriend. The following recipes should give you some ideas as to what to make since they are only building blocks. Feel free to customize them to your own tastes. Pasta is an extremely easy dinner to make. Pair it with some rolls and a side salad and you have a whole meal. A few words of caution: avoid garlic bread since it will give you bad breath. Also avoid spaghetti. Yes, it is very traditional when thinking of pasta, but it’s also a flop. Spaghetti will send little bits of sauce flying about into faces, clothes, and napkins alike. Instead, stick with cannelloni, mostaccioli, penne, or rotini. They are all small enough to take a forkful without having them swing about. Add a bit of mozzarella on top with a fresh sprig of parsley and voila. Dinner rolls can be purchased from the store. If you want to be considerate, you can buy a variety of salad dressings so she can choose her own. If you’re looking to add a bit of protein into the mix, then try a roasted chicken. It looks so impressive coming out of the oven or sitting at the table, plus it smells damn good. In actuality, roasting a chicken is very simple. Get a whole chicken, take out the insides (they’re already in a bag) and tuck in the wing tips behind the chicken’s body so that they don’t get burnt. The next step is to tie the “feet” together using unwaxed floss or butcher’s twine (if you have it). Then you just salt and pepper with a little bit of butter on top and roast it for an hour and a half, on average, at 350 degrees or until the chicken is done. Serve with some mashed potatoes and either wild rice or vegetables, and your meal is complete. The vegetables can even be roasted along with the chicken, saving you some extra time to get ready for the big night. Plus, if you make enough, you’ll have plenty to eat the next time you’re by yourself. After dinner comes the best part: dessert. No matter what you chose to cook, a parfait is a wonderful dessert to make. It’s very easy to customize to your tastes. All you need is some pudding, cake, and another ingredient of your choice. Alternately layer cake cubes, pudding, and raspberries/chocolate chips/nuts/etc. Top it off with whipped cream and you’re done. All of the separate components can be made from a package but that won’t matter when you present it to your date. The dessert can be individually served or simply come out in a large bowl or serving vessel by itself. If you aren’t a parfait person consider ice cream, custards, pies, or cakes all of which can be made fairly easily or found in a store.